Whether you’re experimenting with complex culinary projects like the Tur-duck-hen (a deboned chicken cooked inside a de-boned duck cooked inside a deboned turkey) or simply upgrading a cheaper cut of meat by trimming out gristle and bone, boning and fillet knives are essential. A slender blade removes unwanted flaws without making a mess of the rest of the meat. Boning knives allow the cut to follow the bone, separating the meat with little waste. 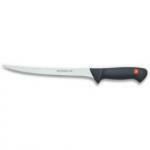 The narrow knife twists easily to follow tight curves and accurately trims off fat and skin. 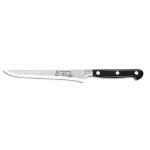 This is the knife to use for shaping tenderloin or deboning poultry — stiffer versions work best for larger and tougher cuts like mutton. Also here are the fillet knives any fisherman knows and uses. With more flexible blades, the fillet knife shapes itself to the ribs of the fish, slipping the meat from the bones neatly. In expert hands this can be the most efficient way of cleaning the fish — save the bones for soup stock instead of picking them out at the dinner table. Match the size of the knife to the size of the fish and you can fillet anything from pan fish to king salmon. Here’s one place where I definitely prefer laser cut steel over forged — the Global Boning knife has an unusual handle style that works well. Seamless, efficient and razor sharp. Damascus steel and a VG-10 cutting edge make the Shun Classic Boning Filet knife perfect for tough cuts and delicate work. 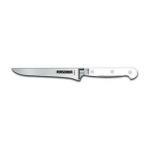 This flexible boning knife with six-inch-long blade follows contours well and slips into tight places, allowing clean cuts with very little waste. Chefs prefer stiffer blades for the tougher meats like beef, but the Wusthof Gourmet performs well for fish and poultry, and Wusthof recommends it for ham. 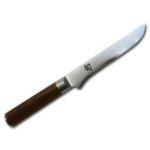 If you're looking for a flexible Western-style boning knife with the performance of Japanese steel, look no further.